« IR dome cameras,are they as good as we hoped? Fitted with a newly developed 1.3 Megapixel MOS sensor, the WV-SW395 IP megapixel camera delivers high quality images in HD 720p and up to 30ips. In addition the WV-SW395 has been fitted with Panasonic’s newly developed MOS sensors. With 360 degree panning and auto flip function this camera smoothly captures the scene and reproduces crisp clear images in HD quality. Image clarity is bolstered by using super dynamic technology and an auto day night function means low light level images are recorded in mono to ensure a better all round low light images. 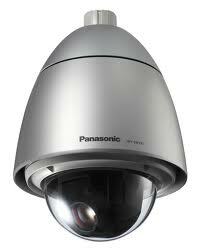 The WV-SW395 also incorporates Panasonic revolutionary facial detection technology, the camera is able to transport the facial images captured to a suitable NVR recorder. Another winner from Panasonic? Well it certainly looks that way. This entry was posted on Tuesday, March 8th, 2011 at 04:36	and is filed under IP cameras. You can follow any responses to this entry through the RSS 2.0 feed. Both comments and pings are currently closed.